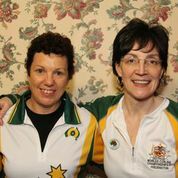 An amazing story told by the Irish World Mixed Doubles representative – Louise Kerr. 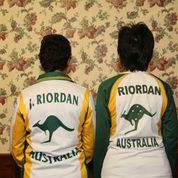 Last year in Fredericton I asked Jenny Riordon of the Australian seniors team if I could swap tops with her at the end of the world seniors as my mother’s maiden name was Reardon (different spelling, same pronunciation). On Monday there I was asked to go and play at Stranraer in a bounce game against the Australian ladies who were staying at the North West Castle and practising at the ice rink. I knew Jenny would be there but she was stunned to see me walking in with her Australian curling top on. Jenny’s husband Peter has done some research in his ancestors and discovered that he is descended from John James Riordan who was born in Cork in 1815, emigrating to Australia in 1839. My mother was born in Bandon, Co Cork and I still have Reardon cousins living in Cork City. The family reunion was worth a special photograph.